Here you will find systems that we have put together that offer outstanding sound quality at a given budget. Every once in awhile when you combine components the "magic" happens and the combination of the parts is greater than the whole and you get a great sounding system. We match components and speakers using our fifty years of knowledge and experience to bring you systems that perform above the ordinary, in fact you could say extraordinary. Please come by and give them a listen. This Stereo Shop custom matched music system featuring Golden Ear Technology Triton Two tower loudspeakers, and Yamaha High-End Hi-Fi audio components. The Stereo Shop from time to time offers certain extraordinary music systems that as a whole sound greater than the sum of their parts. We are always playing with different component combinations and will find a system that blows us away. It is a synergistic interaction of components working together that just really please the music enthusiast. Our latest discovery is a smashing but affordable system that features speakers from a brand-new company and electronics from an old established name in high fidelity: the Golden Ear Triton Two speaker system, the Yamaha AS-1000 audiophile integrated amplifier, and the Yamaha CDS-700 audiophile compact disc player. Golden Ear Technology of Stevenson, Maryland is a new company founded by Sandy Gross, a co-founder of Polk Audio and Definitive Technology, both legendary American speaker firms. Now the culmination of his experience and expertise is found in a speaker system taking the audio industry by storm: the astonishing Golden Ear Triton Two towers. 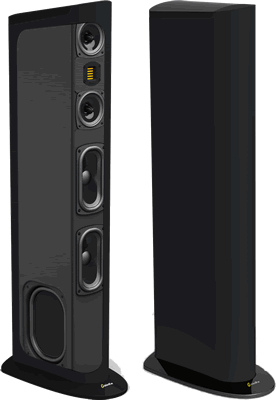 Golden Ear uses breakthrough speaker technologies to provide an affordable loudspeaker with a ribbon tweeter, dual midrange drivers and powered double subwoofers. Ribbon tweeters are normally found in much more expensive loudspeaker designs because they are known for their silky smooth and highly detailed sound quality. This remarkable and unique tweeter propagates sound waves and moves the air by squeezing it with its accordion-like pleated diaphragm, rather than pushing it as conventional drivers do. Above and below the tweeter in a D'Appolito array are two midrange-upper bass drivers. The result is music that's so smooth and effortless with pin point imaging that you will soon forget you are listening to loudspeakers at all! In addition, each Triton Two tower utilizes a powerful internal 1200 watt digital amplifier to drive the subwoofer section. This powerful amplifier drives two front-mounted quadratic subwoofer bass drivers which are coupled to dual side-mounted quadratic planar infrasonic bass radiators. The result is powerfully profound, delivering both musical subtlety as well as room-shaking authority, with deep, and musically accurate bass that will have you either tapping your toes to the beat of your favorite music, or singing along with the volume turned to 11! Because of the Golden Ear internally-powered subwoofers, this system is essentially bi-amplified, and the midrange-treble duties are handled by Yamaha's latest audiophile stereo integrated amplifier. The Yamaha AS-1000 rated at 90 watts per channel of power, is part of their new Hi-Fi series of audiophile components built with painstaking attention to detail and incorporating only the highest grade of hand selected parts. This superb amplifier incorporates a "floating-balanced design" which greatly lowers the amplifier's noise floor and distortion, resulting in exceptionally pure and transparent sound quality, and features outstanding dynamics and control provided by its four massive power supplies. This is an amplifier designed to provide exquisite musicality for the most demanding connoisseurs. We were extremely impressed with this amplifier with its world-class construction quality. The front panel and controls are fabricated from aluminum which gives them an elegant appearance and feel while operating. You will find no "bells or whistles" or flashing lights on this amplifier; only the necessary controls to provide you the ability to achieve the utmost performance. Pure and simple to operate! We found this to be a supremely musical amplifier and an uncanny match for the Triton Two loudspeakers. The combination delivers an astonishing musical experience that will leave you wanting to listen for hours on end! The Yamaha CD-S700 Single-Disc CD/Super-Audio CD player incorporates a High precision CD drive, Finally, the Yamaha CD-S700 Single-Disc CD player is beautifully musical, and among the finest CD players we have heard for under $1,000! This player utilizes an audiophile grade differential D/A converter to assure every last nuance of your music is extracted from your CDs. Yamaha also provides a convenient USB connection on the front panel to connect your Ipod or MP3 player. Your portable player never sounded better as it plays back through these exceptional D/A converters! The disc player's transport is so smooth that you will love its quiet action the moment you first open the drawer. Yamaha has not overlooked even the smallest detail in this player's construction. They have fabricated the CDS-700's front panel from aluminum, not the plastic that other companies provide you with, to keep any resonance and vibration from reaching the player's transport mechanism that could hinder its performance. There is even a Pure Direct control that disables any unnecessary functions, such as the front panel's display, to prevent electrical noise from being introduced in the player. The Yamaha CD-S700 disc player has exceptional sound quality and musicality, and would be a tremendous addition to any audio system. What great sound! This gorgeous CD player combined with the Yamaha AS-1000 amplifier and the Golden Ear Triton Two speakers simply outperforms any other audiophile system near its price range. The Stereo Shop is very excited to have the brand-new Golden Ear Technology Triton Two loudspeakers on display now with the latest Yamaha Hi-Fi separate audio components. This is a rare and fabulous system for anyone who wants to own the best at an affordable price. Come on in, bring a few of your favorite recordings and allow us to demonstrate how life-like your music can sound!